Note: This article is a condensed version of a speech Caesar gave at Singapore’s Smart Nation Innovations Week Opening Symposium on June 5, 2018. Humans have invented technology to help themselves and each other for centuries. While we often refer to technology as the shiny, new innovations like self-driving cars or voice assistants, its breadth is much more than that. Technology also includes the things that are so bound up in our daily lives that we have stopped thinking about them as technological innovations—things like language, clothes, and shelter. Something as basic as an internet connection can mean the chance for a higher education, a new job, or improved skills. In India for example, every month more than 8 million people use Google’s public Wi-Fi programme, Google Station, to get online and access job training material or educational resources. Shrinath, a railway porter in Kerala, used the free, high-speed Wi-Fi at his public transit station to study for and eventually pass the entrance examinations to the Kerala civil service—a feat that would have been much more difficult if Shrinath hadn’t embraced the internet. 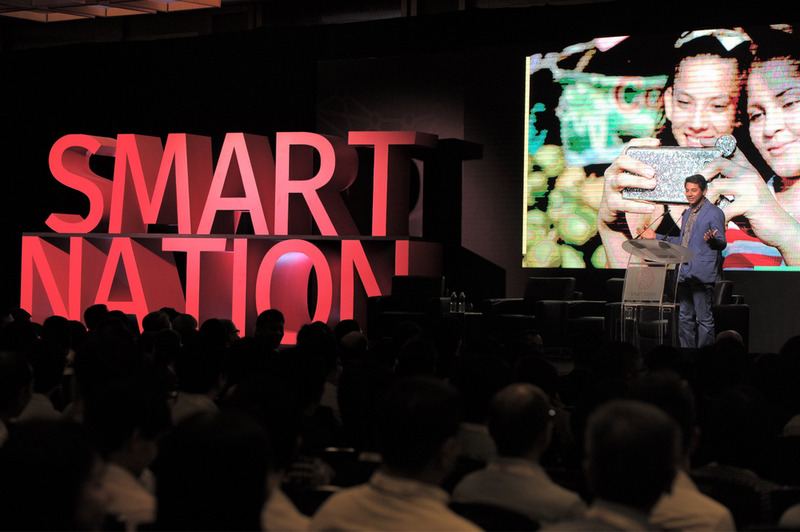 Caesar speaking at Smart Nation about the need to embrace new technologies. It’s also opening up opportunity for businesses, big and small. With access to online platforms, companies have more ways to reach customers and grow. And every business can benefit from digital tools, even the most traditional ones. Hai Sia, a 40-year-old family-run seafood wholesaler in Singapore, for example, was a largely face-to-face business in a bustling fish market. Today, they’ve reached new customers with digital advertising and other digital tools like YouTube videos that show the company’s work. Technology isn’t just about digitising existing businesses—it’s also creating new kinds of entrepreneurs and industries. Look at YouTube creators, who run businesses that were born on an online platform and that could not have existed before the internet. GO-JEK, a startup that started as a motorbike-hailing company in Indonesia, has facilitated the emergence of a new type of business with their food delivery service: allowing home cooks to become restaurateurs. Freed from the costly requirements of renting a restaurant space and hiring staff, people can run profitable businesses right from their kitchens at home. Every technology breakthrough has transformed how we live and work. In the early 1980s, the PC revolution made computers part of people’s lives and changed how we work. In the 1990s, the internet transformed how we find information and opened up new economic opportunity. Then, in the mid-2000s, smartphones brought all that knowledge into our pockets. Now AI is the next frontier. As we continue to explore what benefits AI can bring, we need to lean into this shift rather than shy away from it. After all, the world would be a very different and much poorer place today if our ancestors had given up on fire or language or the wheel. The reaction to technology we don’t know how to use well isn’t to stop innovating. The right reaction is to work harder and innovate even better so we can make technology work for everyone. Lava is an authorised Cloud Partner of Google and is a reseller of G Suite (previously known as Google Apps, Google Maps for Work, and Google Cloud Platform) in Malaysia. We also provide cloud hosting and cloud migration services. With more than a decade of experience in the industry, we’re proud to say we’re one of the leading cloud service providers and consultants in the Asia Pacific region.